We love smoothies at our house for breakfast. My boys aren't really big banana eaters, so smoothies are the perfect way to sneak them into their diet. 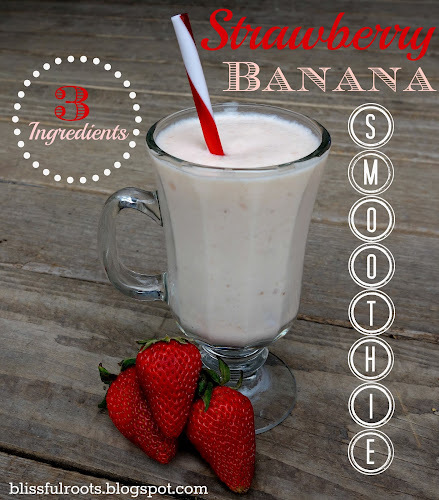 I know there's a lot of amazing smoothie recipes out there, and I love trying new ones, but this is a favorite because it's so easy! Only three ingredients blended together and you're done. I often buy the banned bananas at the store. They're reduced in price and they're in the perfect state for smoothies or our favorite sour cream banana bread. I've tried other yogurt, and they're great, but the strawberry Kroger brand (I buy it at Smith's) has great flavor in the smoothie, and it's really inexpensive. I use my Ninja (the same Ninja I use for our fresh salsa) for our smoothies, but you can use whatever will chop up your ice and blend everything together. 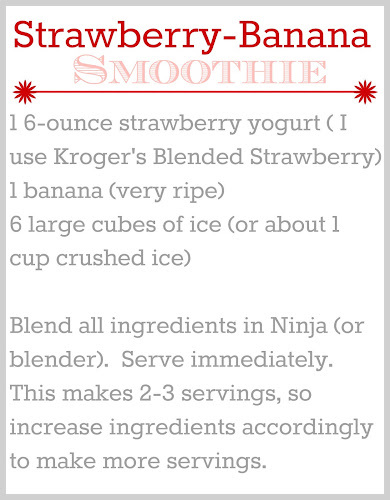 This easy smoothie is the perfect way to start your morning, or a great way to cool down on the hot summer days ahead. Definitely need to try this! Looks delicious! It is delicious, and so, so easy! Thanks so much for taking the time to visit and comment, Holly! Have a great day! Your welcome Susan. Thanks so much for visiting. Come back anytime! Yummy recipe and super easy too! Thanks for sharing! Hey, Trish! I'm so honored you're here to comment. I LOVE Mom On Timeout! You have the best recipes. Thanks so much for visiting. Come back anytime! Thanks so much, Alyssa for the nomination, and for the sweet comment. I sure appreciate it. Have a wonderful day! YUM! So glad you linked up to Give Me the Goods Monday link party! My son loves smoothies and we can never get the amount of ice correct! Can't wait to try this! اتصلوا الان واحصلوا على خدماتنا بأقل الاسعار المميزه وفى اقل وقت ممكن شركة أبوسمره لجميع الخدمات المنزلية . شعرنا التثقي المتبادله دئما .